The Antalya region contains some of the very best Roman attractions and remains in the whole of Turkey, with the finest residing within Ankara, Aspendos, Izmir, Perge and Termessos, all definitely deserving an excursion. Day trips from Antalya are exceedingly popular with tourists, who often head to Alanya for its beachfront attractions, to Bodrum for its endless water sports, or to Cirali for its natural coastline and tranquility. During the peak summer season, Antalya is well connected to much of Turkey, with regular buses transporting tourists as far afield as the attractions of Istanbul, which is without question one of Turkey's most vibrant and alluring cities. Near to home are the destinations of Demre, Denizli, Isparta, Kemer, Olimpos and Patara, each of which has something special to offer day trippers. Perhaps the most exciting city in Turkey and certainly the biggest - by far, Istanbul stands to the north of Antalya and although in fact is a little too far to make a day trip viable, does warrant an excursion, and really a dedicated holiday. 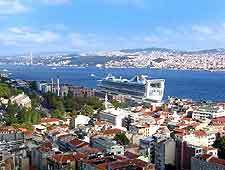 The attractions of Istanbul certainly match the city's status and are so numerous that you will need to plan ahead and do a little research, so that you can be sure to see all of the main sights. 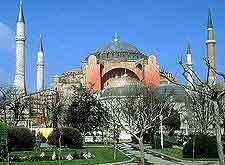 Especially noteworthy in Istanbul is the magnificent Hagia Sophia (Aya Sofya), which dates from the 6th century and has become a symbol of the city, as the Blue Mosque (Sultanahmet Mosque), with its elaborate minarets and arresting architecture. 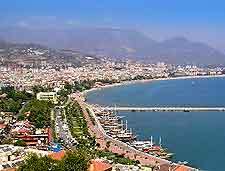 Alanya is particularly close to Antalya and is sited to the south-west, where it is less than two hours away by road. The hilltop castle at Alanya is an instantly recognisable sight, while the Damlatas Cave is also extremely popular, as is the Damlatas Beach. Tourists who have soaked up their share of the Turkish sunshine may like to cool down by taking a fun ride on an inflatable banana boat, or parasailing high above the coastline. The largest go-kart track in the whole of Turkey is also to be found within Alanya. As Turkey's capital city, there is no way that you cannot take an excursion to north-easterly Ankara, although day trips aren't really possible. 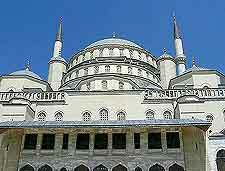 Ankara resides within the very heart of Central Anatolia and Turkey itself, and is extremely tourist friendly. The Ataturk Mausoleum (Anitkabir) is one of the most visited attractions, along with the ancient Roman Baths, the Temple of Augustus and Rome and the Ankara Citadel (Hisar). Something a little more suitable for holidaying families with children is the Aquapark Club Watercity, as well as the Ataturk Forest Farm and Zoo. Aspendos has long been one of the top attractions within the Antalya province and is just 40 km / 25 miles to the east, and 4 km / 2.5 miles to the north of Serik town. 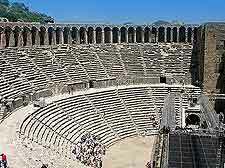 This ancient city is filled with wonderful Roman remains and was founded as long ago as 1000 BC. Aspendos is perhaps best known for its stunning amphitheatre, which is of epic proportions and once accommodated around 7,000 spectators. 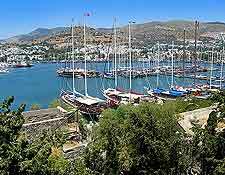 The Turkish port town of Bodrum is to the west of Antalya and on the southerly shoreline of the Bodrum Peninsula. Today, the town enjoys a thriving tourism industry and attracts tourists from the world over. Bodrum's castle (Castle of St. Peter) is amongst the leading attractions here and was actually built in 1402, remaining one of the best preserved medieval monuments in existence. The beachfront in Bodrum is quite acceptable, although the beaches in nearby Gumbet are more inviting. Various water sports are on offer here, such as snorkelling, scuba diving, fishing, water-skiing, jet-skiing, and of course, yachting. 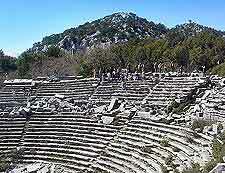 Cirali is a coastal village and near to both Antalya and the ruins of Olimpos (Olympos). At little more than an hours' drive away from Antalya, Cirali is ideal for a day trip and its attractions are especially varied, ranging from landscaped gardens and mosques, to a protected sandy beach, which is used as a nesting spot each year by crowds of Loggerhead sea turtles. 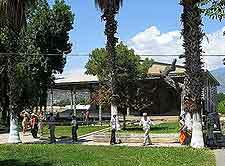 Much of Cirali's appeal is simply the fact that it remains unspoiled by development and mass tourism. The winter sports resort of Davras is around 135 km / 84 miles away (90 minutes' drive) and is located within the Taurus Mountains. At just over 2,600 metres / 8,520 feet high, the Buyuk Davras is the resort's highest peak and features ski runs for all abilities. The Davras resort opens for winter sports at the beginning of December, although heavy snows don't usually arrive until early January. 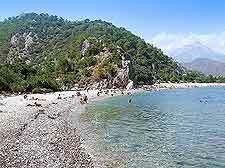 Demre resides within the Antalya Province and is roughly 32 km / 29 miles away from the city, being found on the coastline of the Teke peninsula. The town of Demre contains the very famous St. Nicholas Church as is actually the home of the original Santa Claus - Saint Nicholas of Myra. A number of the cliff sides surrounding Demre are known for their Lycian rock tombs and are worth checking out. A very notable Turkish transport hub and standing directly north-west of Antalya, Denizli is a rapidly expanding industrial city, with a population now exceeding 400,000 residents and a good selection of attractions. On the northerly outskirts of Denizli, the World Heritage Sites of Hierapolis and Pamukkale are within easy reach, while in the very heart of the city centre, the Forum Camlik Shopping and Lifestyle Centre is always busy. If you fancy a summer picnic with tranquil surroundings, do consider a trip to the neighbouring Honaz mountain. Capital of the Isparta Province, the city of Isparta also goes by the name of the 'City of Roses', since it has become very well known in Turkey for its rosewater production, as well as hand-woven carpet making. Tourists often choose to pay a visit to Isparta, to explore the historical buildings, mosques and biblical sites used as pilgrimages. The city's Byzantine fortress may well be of interest, although is mainly in ruins. 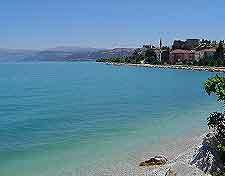 Isparta is located around 130 km / 81 miles to the north of Antalya and is well connected to much of Turkey by both road and rail. Turkey's third-most densely populated city after Istanbul and Ankara, Izmir can be found to the north-west of Antalya and offers both an appealing coastal location and a rich Turkish heritage. Many attractions in Izmir are to be found based around Konak Square and its iconic clock tower. 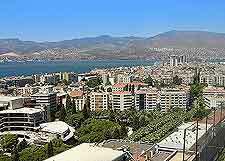 Innumerable eateries and bars are clustered within the Alsancak neighbourhood, with shoppers always finding the bazaar in the Kemeralti area most agreeable. The ancient Roman remains of Agora are something of a must-see in Izmir and not to be passed over at any cost. The Turkish seaside resort of Kemer is just 40 km / 25 miles to the south-west of Antalya and is also close to the westerly Taurus mountains. Over the past few decades, Kemer has seen a major boom in tourism, due to its extreme natural beauty, charming seafront, unspoiled beaches around Adrasan Bay and Cirali, and recreational attractions based in the adjacent forests and mountains. 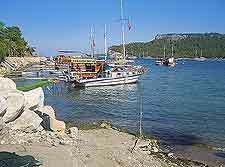 The yacht marina is a particularly lively part of Kemer and many boat races take place close by throughout the year. Scuba divers will enjoy exploring the underwater landscape around the Uc Adalar (Three Islands), while those looking for nightlife will find plenty of clubs and bars, remaining open until late. The town of Olimpos stands around 55 km / 34 miles to the south of Antalya, where it boasts a very appealing pebbly beach and some well-preserved Lycian remains. Olimpos is much favoured by backpackers, since much of the accommodation is of a budget standard, and often comprising treehouse-style bungalows. A number of restaurants flank the Olimpos beachfront and provide dining with a view. Patara is a flourishing coastal Mediterranean city within the Antalya Province and located directly to the south-west of the city itself. Famed for its stunning golden sandy beachfront, the attractions of Patara are very much based around its gorgeous coastline and expansive natural harbour. The ruins of Patara are also very special and stand close to both the seafront and River Xanthus, consisting of an excavated theatre, temple and ancient town walls. The fascinating ruined Pisidian city of Termessos overlooks the Antalya gulf and is perched upon Mount Solymos, within the Taurus mountains, where it is just 30 km / 19 miles away and to the north-west. A number of truly spectacular ancient structures remain around Termessos and date back almost 2,000 years, such as the agora marketplace and amphitheatre. Flora and fauna attractions are plentiful within the Termessos National Park, along with dense forests of pine trees. Historians can only speculate as to the exact details of the history of this ancient site, but know that it was constructed as a fortification to keep out enemies, including Alexander the Great. Despite repeated attacks, Alexander was never able to overcome the fort. The structure occupies a location high above the city and offers fantastic views of the Gulf of Antalya to those who make the 2-km / 1.5-mile walk here.